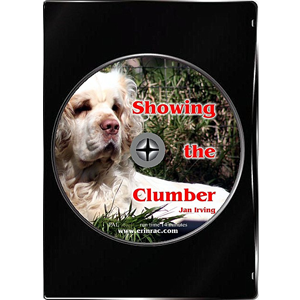 SHOWING THE CLUMBER is for the handler who already understands the fundamentals of exhibiting but wishes to improve the impression they and their Clumbers give in the showring. For 20 years Jan Irving has been exhibiting the Erinveine Clumbers, and here she shares some of the refinements that make the Clumber a strong contender in the show ring. Jan has primarily handled Clumbers in Australia as far as Best in Show on several occasions but has also shown and won in New Zealand. Approximate running time is 14 minutes. This edition is in PAL format, the format used in the UK, Australia, and New Zealand – USA residents are advised to contact the store owner about wanting to purchase a NTSC format, it will only be produced if 20 orders are received -so order now!